What are some signs a child’s language may not be developing at the right pace? 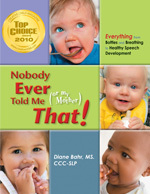 The following is an interview with Diane Bahr (Published Author and International Presenter on Feeding, Motor Speech, and Mouth Development) by Cintia Saporito (Journalist in Argentina). This interview was conducted in February, 2017. Question from Cintia Saporito: What are some signs a child’s language may not be developing at the right pace? We are seeing a lot of late speech and language development in children these days. Speech is a fine motor function, and many of our children are not developing appropriate postural control needed for many fine motor functions in the body (e.g., speech, feeding, hand use, and vision use). This is likely secondary to babies spending so much time on their backs and in containers (e.g., car seats, swings, baby seats, etc.). If vocal speech is not developing, it is difficult for language to develop as these go hand-in-hand. Therefore, it is imperative parents have accurate literature-based, criterion-referenced speech and language checklists to be sure their children are developing at the right pace from birth. Such checklists are found in my book Nobody Ever Told Me (or My Mother) That! Everything from Bottles and Breathing to Healthy Speech Development. Without such checklists, parents often do not realize their children are not progressing at the right pace. A pediatrician is the child’s general doctor, and they know much. However, most pediatricians only have some basic information for tracking a child’s speech and language development. For example, most pediatricians know children begin to say single word approximations around 1 year of age (this actually begins between 9 and 12 months). They will also tell parents children should be putting two words together at 24 months (this actually begins between 18 and 21 months), but there is much more to language than just saying words. Babies socialize and vocalize from birth, and this is a precursor for language development. By 6 months, a child should be saying most vowel sounds in his or her own native language plus some consonant sounds. A 6 month old baby should be taking conversation-like turns while vocalizing with others. He or she should also respond to his or her name. During the 7 to 9 month period, babies put vowels together in a conversational, sentence-like manner, and begin using standard gestures (e.g., waving hand for “bye bye”). During the 9 to 12 month period, first words are heard (e.g., “dada, mama, bye bye, no, go, me”), and children this age often sound like they are talking in sentences (called jargon). Children usually begin to identify objects (that are named) and answer questions via gestures, body language, and/or vocalization during this time. During the 12 to 15 month period, children can say 5 or more single word approximations. They use a variety of gestures, begin singing, and imitate some words they have not said before. During the 15 to 18 month period, children can name objects, actions, and events; make requests; comment, acknowledge, protest, answer, call, and greet. They are learning about 10 new words per month. During the 18-21 month period, the two-word stage begins and these children can imitate 2 and 3-word sentences. They ask and answer simple questions (e.g., Where’s mommy?). During the 21 to 24 month period, children are putting 2 or more words into simple sentences and they primarily communicate with speech. Children in this stage can say between 50 and 270 words using many parts of language (e.g., verbs, adjectives, adverbs, and pronouns).